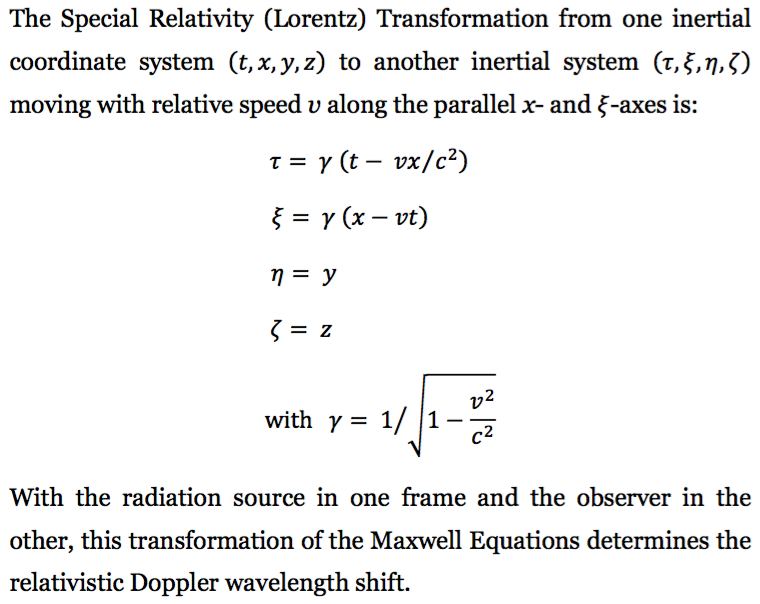 Special Relativity explains the Doppler Effect of light (electromagnetic radiation). When the radiation source approaches (or recedes from) the observer, the radiation frequency is shifted. See Section 7 of Einstein's 1905 paper On the Electrodynamics of Moving Bodies. Enter below: (1) the speed of the source toward (positive) or away from (negative) the observer as a fraction of the speed of light and (2) the wavelength of light in nanometers in the range of 380 - 780. This is visible light. Click "Show Colors" to see the colors of the light in the source and observer frames of reference in the two boxes beneath the input values.